Terren Gomez unlocks the faded red door to his Eloise Avenue workshop. Inside, the smell of sawdust, varnish and wood glue drifts under yellow fluorescent lights. 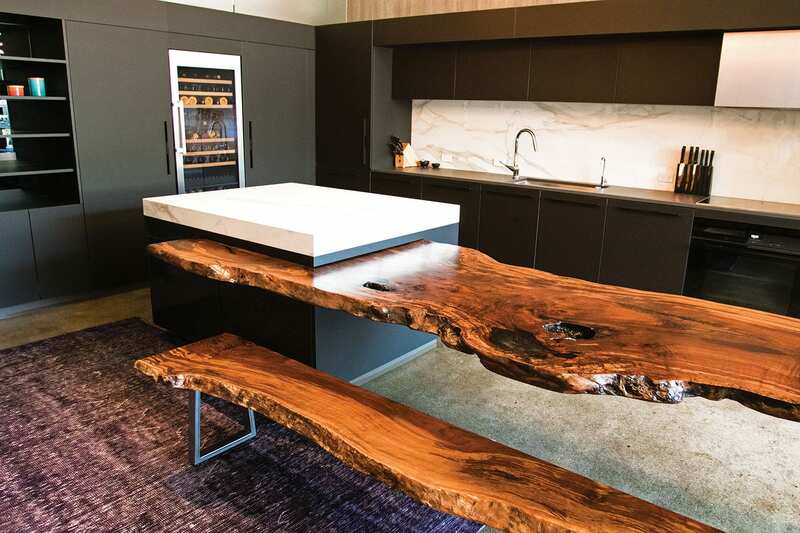 A 10-foot slab of freshly glued black walnut lies on one surface, clamps squeezing drops of adhesive from its joints. The board is destined to become a polished Mez Works signature piece. 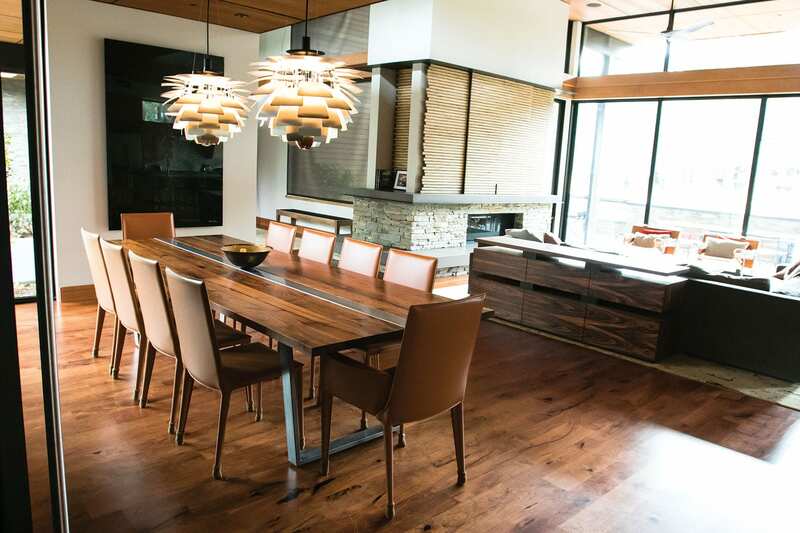 The South Lake Tahoe furniture company specializes in luxury wood furniture, particularly high-end tables. Its lacquered creations cost thousands of dollars and have attracted buyers from all over the country. Started in 2010, the business has grown from Gomez’s garage to three large rental spaces with a half dozen employees, including his fiancé Allie Halperin. Gomez has lived in the Lake Tahoe area since he was 10. Furniture building wasn’t his first career choice, though. The 31-year-old began as a snowboard photographer. His images frequented industry magazines and were regularly bought by board companies. But the work wasn’t steady. In a way, it pushed him into his current gig. A cornerstone of Mez Works’ style is the high-quality lumber he chooses for his table designs, like the Zeeva, the Martis, the Insignia and the Graphite. 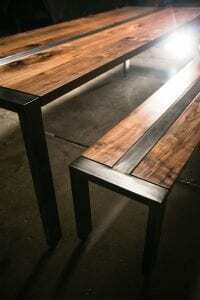 Most of the wood is reclaimed or salvaged and a lot of it comes from within 200 miles of his shop. He glues and sands the thick, raw boards before attaching his handmade steel components. On the 10-foot walnut slab, it would be hard to see the seams between the 12-inch boards, if it weren’t for the yellow droplets of glue. Mez Works sells much of its furniture on the craft site Etsy.com. Gomez’s background in photography has helped him build a dazzling portfolio of marketing images. His website is starting to pick up traction, and word of mouth about the tables is getting around. His style has started to evolve, too. Gomez is moving away from Mez Works’ rustic “log cabin” roots into more of a modern style. It’s reflected in the demand, he says. He’s working with an Incline Village architecture firm to get some of his pieces in Martis Camp homes. The company’s geometric steel table bases and minimalist metal accents illustrate the modern aesthetic. Gomez welds the table legs himself, paying careful attention to every aspect of the metalwork. He likes the seamless, almost industrial look. The construction is often not the hardest part of the job, though. Shipping 12-foot-long, 200-pound tabletops and bases presents its own challenges. The busy holiday season, when Mez Works ships four to five pieces a week, can be pretty stressful, Gomez says. It’s not all sawdust and varnish for the crew. Gomez has tried to create a balance for him and his employees between work and play. But it’s always tricky, especially during the Christmas and holiday rush. Gomez is starting to think about expansion. He’s been considering a retail space in the South Lake Tahoe area, but he’s not sure how big he really wants Mez Works to get. He feels fortunate to have come this far. “I feel really lucky to be able to do this for a living and have a good crew that I can rely on,” he says.